We Are Saved by the Literal Blood of Jesus! We don't hear enough these days about the precious literal blood of Jesus, "...and the blood of Jesus Christ his Son cleanseth us from all sin" (1st John 1:7). What a wonderful Savior! Jesus paid a debt that He did not owe, because we owed a debt that we could not pay. Our sins had to be paid for with Jesus' literal blood. In the Old Testament, the people's sins were only ATONED (i.e., covered) for. Leviticus 17:11 states, "For the life of the flesh is in the blood: and I have given it to you upon the altar to make an atonement for your souls: for it is the blood that maketh an atonement for the soul." This Scripture speaks of the blood of animals, which were sacrificed to temporarily cover the sins of the people in the Old Testament, until the Messiah would come and offer the perfect Sacrifice of Himself to God the Father. We read in Hebrews 9:12 concerning Jesus, "Neither by the blood of goats and calves, but by his own blood he entered in once into the holy place, having obtained eternal redemption for us." Amen! Jesus' literal, physical blood didn't atone for our sins; but rather, took them away forever! Hebrews 9:24-26 state, "For Christ is not entered into the holy places made with hands, which are the figures of the true; but into heaven itself, now to appear in the presence of God for us: Nor yet that he should offer himself often, as the high priest entereth into the holy place every year with blood of others; For then must he often have suffered since the foundation of the world: but now ONCE in the end of the world hath he appeared to put away sin by the sacrifice of himself." Jesus' blood applied to the Mercy Seat in Heaven is all-sufficient. Jesus only needed to offer Himself as a sacrifice once. This is what is wrong with the Catholic crucifix... they keep Jesus on the cross. In the Catholic mass, participants actually believe they are digesting the literal body and blood of Jesus Christ each time. They call this the doctrine of transubstantiation. This is unscriptural. Jesus is NO longer on the cross. Also, every crucifix I've ever seen makes Jesus' look decrepit and sickly. Our Lord was a carpenter, and they didn't have power tools back then. Jesus was a strong man, not some sissy looking wimp. Catholics have some strange ideas of Christ. Jesus died on the cross, was buried to confirm His death, and then rose victoriously 3-days later. Christ is alive! Thank the Lord for His mercy and grace, for paying for our multitude of sins with His precious literal blood. The Blood Does NOT Merely Represent Jesus' Death! There is a damnable heresy circulating in many of our churches today, popularized by religious liberal Modernist, John MacArthur. Dr. MacArthur teaches that Jesus' liquid blood has no value or significance in and of itself. He claims that Jesus' blood is important only in the sense that it represents the DEATH of Christ. Nothing could be further from the truth! When God told Moses to warn the Israelites concerning the coming 10th plague, i.e., the death of the firstborn, the people were instructed to kill a lamb, and then APPLY the lamb's blood to the doorposts and lintel (beam above the door) of the home. Would somebody please show R.B. Thieme Jr. and John MacArthur Exodus 12:23, "And the blood shall be to you for a token upon the houses where ye are: and when I see the blood, I will pass over you, and the plague shall not be upon you to destroy you, when I smite the land of Egypt." Did you read that ... WHEN I SEE THE BLOOD!!! Carefully notice that the Lord wasn't looking for the dead lamb. Rather, the blood had to be APPLIED. Also, please read, The Importance of the Blood. John MacArthur is an unsaved liberal. R.B. Thieme, Jr. and John MacArthur... Heretics! It's All About the Blood of Jesus! From the blood of Abel's slain lamb in Genesis, to the robes of the saints washed in the blood in Revelation, the Word of God centers around the blood sacrifice of Jesus Christ. Hebrews 9:22, "...without shedding of blood is no remission." Jesus' death was just as important as His blood sacrifice, and equally important the burial and resurrection; BUT everything concerning the events of Jesus' life were leading up to the blood being applied in Heaven. Hebrews 9:24-26 state, "For Christ is not entered into the holy places made with hands, which are the figures of the true; but into heaven itself, now to appear in the presence of God for us..." That is, God the Father. Jesus took His shed blood to Heaven to present unto the Father, by applying it to the Mercy Seat. This is why Jesus said to Mary in John 20:17, "Jesus saith unto her, Touch me not; for I am not yet ascended to my Father..." The blood couldn't be tainted. Jesus needed to apply the blood in Heaven, just as the Old Testament Highpriest did in the holy of holies in the tabernacle. So don't let any unsaved Modernist, or false prophet, minimize the importance of Jesus' blood. There could be NO forgiveness of sins if it weren't for Christ's blood sacrifice. Seventh Day Adventists pervert the blood of Christ by claiming that Jesus' sacrifice wasn't enough, and that Christ is still in the process of completing His work of redemption. They call this heresy "investigative judgment," i.e., they claim that Jesus investigates our individual lives to decide whether we are "worthy" to enter Heaven or not. I ask you ... is any sinful human being "worthy" of heaven? Does not Romans 3:23 declare that we ALL HAVE SINNED? Yes, it most certain does! There is NO ONE worthy to enter Heaven, which is exactly WHY we needed Jesus to shed His blood for our sins, because we could not save ourselves. We all deserve Hellfire, nothing better. But thanks be to God for sending His only begotten Son into the world to pay for our sins... "For God so loved the world, that he gave his only begotten Son, that whosoever believeth in him should not perish, but have everlasting life." Amen! 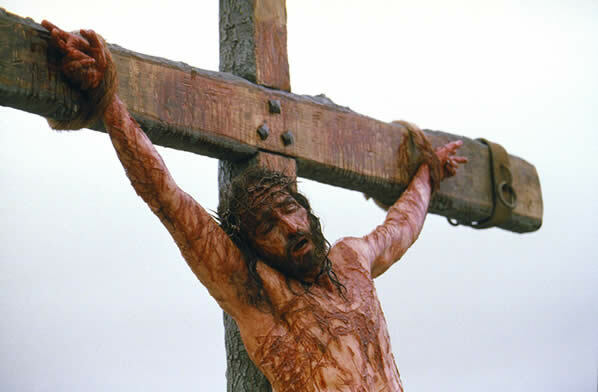 The reason WHY we are to trust Christ alone for salvation is because of the blood that He shed for our sins. ONLY Jesus has the nail-scared hands and feet! No one else! Salvation is found only in Jesus Christ (Acts 4:10-12; John 14:6) because God's blood was shed upon the cross... "Take heed therefore unto yourselves, and to all the flock, over the which the Holy Ghost hath made you overseers, to feed the church of God, which he hath purchased with his own blood" (Acts 20:28). 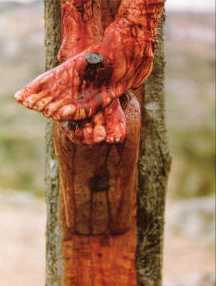 The blood that flowed from Jesus' veins was not the sinful, tainted, blood of Adam; NO, rather, it was the blood of God. Adam and Eve sinned in the Garden of Eden. They went out and sewed fig leaves together. They knew something was wrong and they tried to hide it. Adam and Eve were happy with their fig-leave religion until God came. When God came they were embarrassed with their fig-leave religion and they ran and hid themselves. God killed an innocent animal, which is a picture of the substitutionary death of Jesus. God skinned that animal to make coats for Adam and Eve. God didn't let them keep one fig-leaf of their own making. You may be satisfied to stand before men with your fig-leaf religion, as were Adam and Eve; but how will you feel on Judgment Day when you stand before God, and He casts you into the Lake of Fire? Religion is a paved road to Hell. There are many false prophets today who pervert the gospel, teaching that a sinner must amend his ways, forsake the world, and make a total surrender to Christ's Lordship in order to be saved. Salvation is the free gift of God (Romans 5:15,6:23), paid for by the precious literal blood of His dear Son, Jesus Christ (1st Peter 1:18-19; Revelation 1:5). "But by his own blood he entered in once into the holy place, having obtained eternal redemption for us." The Bible also makes plain when He accomplished this. On the morning of the resurrection He meets Mary at the tomb. As soon as Mary recognized Him, she prostrated herself upon Him, and would have kissed His feet, but with shocking suddenness, Jesus emphatically says to her: "Touch me not"; and then He proceeds immediately to give the reason why Mary is not permitted to touch Him at all. Literally the Lord Jesus Christ said, "Touch me not; for I now am about to ascend unto my Father." We can understand this action when we remember the the high priest after he had offered the sacrifice, was to enter the holy of holies, before he did anything else, with the precious blood. No one was allowed to approach him. Everyone was shut out until this was completely done. And here in the record of the meeting with Mary we have the fulfillment of this type. Here Mary meets her great High Priest, just arisen from the tomb, but before He had entered the holy of holies with the reconciling blood. And so He says to her, "TOUCH ME NOT." SOURCE: The TABERNACLE, by M.R. DeHaan, M.D., ISBN 0-310-23491-3, page 129. What a wonderful truth! The Bible is so clear when you accept It as it's written. The best way to interpret the Bible is to not interpret it. By diligently cross-referring Scripture with Scripture, we are able to form a complete and accurate picture of divine Truth. One of the best books I've ever read concerning the blood of Christ is THE CHEMISTRY OF THE BLOOD, by M.R. DeHaan, M.D.